A little bit of history No-one’s quite sure when and where the concept of modular design first arose. Architecture has a fairly strong claim to being the founding school, and Brunel’s prefabricated hospitals created for despatch to the Crimea get frequent mentions, but the Norman prefabricated castles shipped over the Channel in 1066 shared many characteristics and, as you won’t be surprised to hear that the Romans had thought of something similar, the essentials of the concept are there in Vitruvius too. What perhaps is surprising is that it’s taken this long to take hold in the fountain pen world. So American firm The Inventery got on with making up for lost time, and sent us one or two to check out. How it looks Like a short plain tube or a slightly longer plain tube, depending upon whether you choose to install the extender section. The shape is otherwise fairly featureless, but there’s a fair range of materials and finishes, from plain aluminium and matt black to shiny brass. How it feels Small, to be direct about it. Unextended, it’s just about long enough for brief use as long as the cap is posted. With the extender fitted, it’s long enough to use like a standard pen, but a little top-heavy with the cap posted. How it fills The ‘pocket’ configuration will fit only a small international cartridge, but the extended version has space for a proper twist converter. Crucially, how it writes… Tolerably. The small steel Schmidt nib is nothing fancy, but does the job adequately enough as long as you’re not after flex or flair. There is also a rollerball tip in the pack, if you’re into that sort of thing – which, seeing as you’re reading a fountain pen website, is less than guaranteed, but moving swiftly on… Pen! What is it good for? It’s good for, depending upon your point of view, customisers who like to regularly reconfigure and re-invent their pocket pen, or for terminally indecisive fidgets! VFM This is probably not Inventery’s strongest point, at least when it comes to fountain pens. There are plenty of surplus attachments in the kit to play with, but once you have found the formula which works for you the chances are that you’ll stick with it – and that inevitably means that there will be waste. Waste can be expensive, too; for what this admittedly curious and interesting combo costs, you could get one of the solid metal versions of Kaweco’s proven Sport and be most of the way to acquiring a high-quality gold nib for it too. If this isn’t quite your cup of tea, but almost… Try some different shapes and sizes of fountain pen and, when you find one which you like enough to put it in your pocket straight away, buy that. Our overall recommendation Is to think carefully about why you’re contemplating buying this. If it’s a present for someone who perhaps isn’t a huge pen addict but really enjoys dismantling and rebuilding things, it might go down very well. If you’re a fountain pen aficionado, though, we’d say that this is fun and interesting, but maybe not a high-priority purchase. Where to get hold of one Direct from Inventery is simplest. Alternatively, we’ll be giving away one of the kits we tested as part of our Yule frenzy, which is only a few months away after all – so keep watching! Thanks to Inventery for sending us some samples to test. 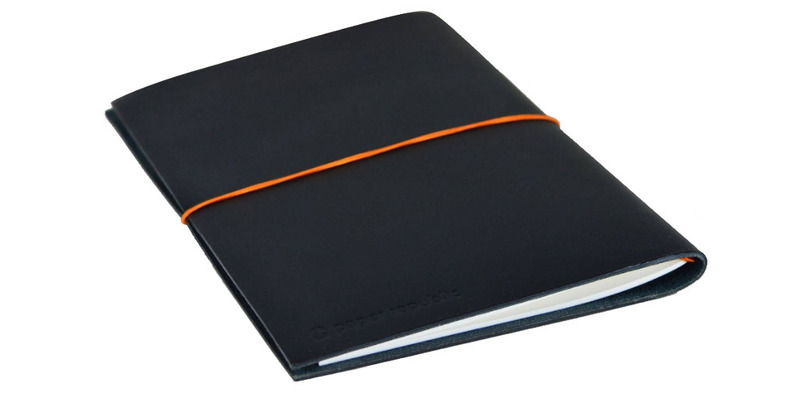 Our next give-away is a classy leather (sniffs appreciatively) journal cover, replete with Grand Voyager Notebook, kindly donated by the manufacturer, Paper Republic. To take part in the give-away, you must be within the UK, have the right answers to this handful of questions and send those answers to unitedinkdomprizes@gmail.com by 31 October. The winner will be notified in the following week and the journal cover sent out thereafter. As ever, the answers to our questions are all to be found on United Inkdom website or on the Paper Republic website. They also do amazing kits too! 1 In which city is Paper Republic based? 2 How many colours does the Grand Voyager XL Notebook cover come in? 3 What price does the Grand Voyager XL Notebook retail at on the Paper Republic website? 4 How many pages does the insert notebook have? 5 How many suppliers does Paper Republic have in the UK? 6 Who are the 3 United Inkdom reviewers for the XL? Happy hunting for the answers!